We’ve reported previously about the Nautiz X1 Ruggedized Smartphone, which was pretty cool but fairly run-of-the-mill, given that it’s simply a phone. 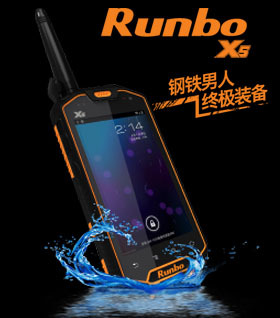 Runbo has taken the ruggedized smartphone (running Android or Windows Mobile, or maybe some sort of Blackberry option?) and integrated a walkie-talkie into it, as well as providing a dual-sim option for WCDMA and GSM cell connectivity. This might be a great option for the radio-connected mine site, but I can’t help but think about the Flight of the Conchords’ Camera Phone. More information (brush up on your Chinese!) can be found at Runbo’s website.